If you’re one of the 54% of companies that is not using automated email lifecycle marketing, (46% do according to a June 2011 eMarketer study) –then statistically speaking, you’re losing money. As the meeting point between website analytics and email marketing, automated email lifecycle marketing allows you to “hyper-segment” your email lists based on real-time information on list subscribers station in your sales funnel, interests, motivations, and other critical behavioral factors that can drastically increase the effectiveness of your email marketing. In short, it’s using behaviorally triggered email campaigns to communicate differently with subscribers based on predetermined milestones. For example, new subscribers getting a stream of “Welcome” emails, or customers who recently made a purchase getting a string of follow-up messages talking about what makes a new product hot or giving helpful tips on how to use. The idea behind lifecycle email marketing is that subscribers at different points in their customer lifecycle respond differently to different messaging. Analytics, allows you to find the message that resonates with them at a certain point, and you noticeably increase their level of engagement and lifetime value. In fact, in that same eMarketer study, 75% of companies that have implemented lifecycle email automation reported that they believed their marketing efforts outperformed traditional outbound marketing programs. That’s a pretty high success rate, and is built upon a fundamental principle of MarketTraq™ software: the best way to know what your customer wants to see and hear from you is to watch what they do, and let them tell you. 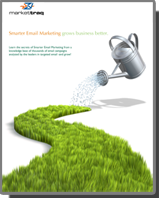 Setting up an effective lifecycle email marketing plan is not simple. More than anything, this is one of the major factors that keeps the initial stat in this post so low. An effective lifecycle email marketing program requires the right analytics, both within your email campaign and on your website. However, three critical problems usually present themselves and these must be overcome. 1. You need to have a tracking solution that identifies where buyers are in the lifecycle. For some events, this is fairly straightforward: people who have just signed up are obviously in the “welcome/new user” stage, just like customers who have just completed a purchase are in the “just bought” stage. More difficult is tracking users who are just browsing products and haven’t made any discrete conversion actions. This is an invaluable segment, since browsers commonly demonstrate intention to purchase and are thus open to up-selling opportunities. It is, nevertheless, difficult to parse out. Similar difficulties arise when a subscriber has performed some action that could reasonably put them into two different segments. For example, someone that has just made a purchase and signed up for the first time could go into the “welcome” segment or the “just bought” segment, or some combination of the two. This is where the second major requirement of lifecycle marketing comes in. 2. You need a robust web analytics setup. In addition to a viable action right tracking capability is having proper web analytics set up. The major problem in implementing lifecycle marketing with a poor web analytics set-up is that email analytics generally end at the click, and standard web analytics set-ups track inbound clicks, even from known email recipients as generic visitors, making it difficult to properly gauge where in the lifecycle each individual currently is. Without having that type of granular knowledge, many segments of the lifecycle are simply unavailable to marketers since any updates on a customer’s’ stage have to wait for that customer to initiate contact (i.e. sign up for a mailing list, order a product, request more information, etc.). With a truly integrated GA set-up, though, the customer can be tracked individually from the moment they open an email to every action and interaction they perform with your site. While Google Analytics has the functionality most e-commerce companies need, it is very helpful to have someone intimately familiar with the ins and outs of website analytics set up the hooks and triggers that notify your email automation program that a customer has moved into a new lifecycle stage. Luckily for MarketTraq™ clients, Google Analytics is deeply integrated at the API level, and provides not only strong post click behavior, but a drop level analysis that includes daypart analysis of sales, and ad-hoc reporting, right from MarketTraq™ itself using a host of GA variables and dimensions. 3. You need a solid and flexible email analytics set-up. Going back to the eMarketer study, a full 39% of companies said they weren’t sure of the impact their email marketing campaigns had. This deficit in proper analytics and measurement capability not only makes it impossible to track positive impacts of changing your email strategy, it also makes optimizing lifecycle email marketing campaigns incredibly difficult, if not impossible. Solid measurement and tracking models, like the ones found in MarketTraq™, are essential for answering questions like the one posed at the end of the last paragraph. For instance, instead of guessing which segment to put a dual-stage subscriber into, a MarketTraq™ user can simply use Test & Roll™ (or a similar split testing feature in their ESP of choice) to run a split test to measure which messaging is more effective. Not having a clear set of measurements to link back to KPIs also eliminates much of the strength of behavior-based segmentation, since it is difficult to compare results to a baseline and determine efficacy. Welcome/New Subscriber: A new subscriber with no other data is going to respond better to general informational messaging. When is your spring collection coming out? What’s in your newest lookbook? What kind of promotions are you running? Post-purchase: This is a great opportunity to build loyalty and to up-sell. Is the product what the customer expected? Will they write a review? Are there any accessories that can be matched with their outfit? Casual Browsing/Demonstrated Intent: A great opportunity for up-selling by targeting their browsing history. Is there something similar to what they were looking at that’s on sale? Are there any accessories that go with their browsed outfits? Do they appear in any lookbooks or other very visually striking marketing materials? Promotion Notifications: If the subscriber has shown herself to be very price-conscious, an upcoming promotion may be an incredibly powerful CTA (call to action). Are there any sales coming up? Can you match sales to the subscribers purchasing/browsing history? What about special promotions just for price-conscious shoppers? Cart Abandonment: We’ve talked about this plenty of times, and will continue to talk about it until every e-tailer is using some sort of shopping cart rescue program. Cross-reference other behaviors (browsing time, referral data, price-sensitivity, etc.) to target the right call to action to the right subscriber. Lifecycle marketing through email can be an incredibly powerful marketing tool when used correctly. MarketTraq’s enterprise level email marketing software lets companies develop strong email marketing strategies that have noticeable impact on the bottom line.